We are happy to offer a 10% discount on parts and accessories and 5% discount on bicycles to active armed forces personnel. 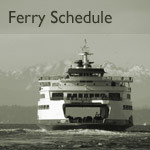 As a thank-you to visitors traveling from Seattle and points west of us, we offer a ferry ticket reimbursement credit. For those of you spending more than $100 at Classic Cycle, we will give you a $10 store credit for making the trip over to see us. All you have to do is bring in your ferry ticket receipt. We take trade-ins. If you have a bike that you’d like to trade, simply bring it in to the store and we’ll make you an offer. We’re generally not interested in bikes that come from mass merchants like Walmart or Target, or French bikes (Motobecane, Peugeot, Gitane) from the ’60′s or ’70′s. If you buy a new bike from Classic Cycle, you can get a little more when it’s time for the next model. We typically give you 20% more for bikes that were purchased here. Just so you know, kids bikes that get traded in within 4 years of purchase are typically worth between 30-50% of their original price. Get your new bike (or Powertap wheel, or new trainer, or whatever) today with six-month interest free financing. The Trek card can be approved on the spot, and you can roll out the door in just a few minutes. If you are buying a new bike from us, we will help you get outfitted. Parts and accessories that you purchase along with your new ride get installed for free.